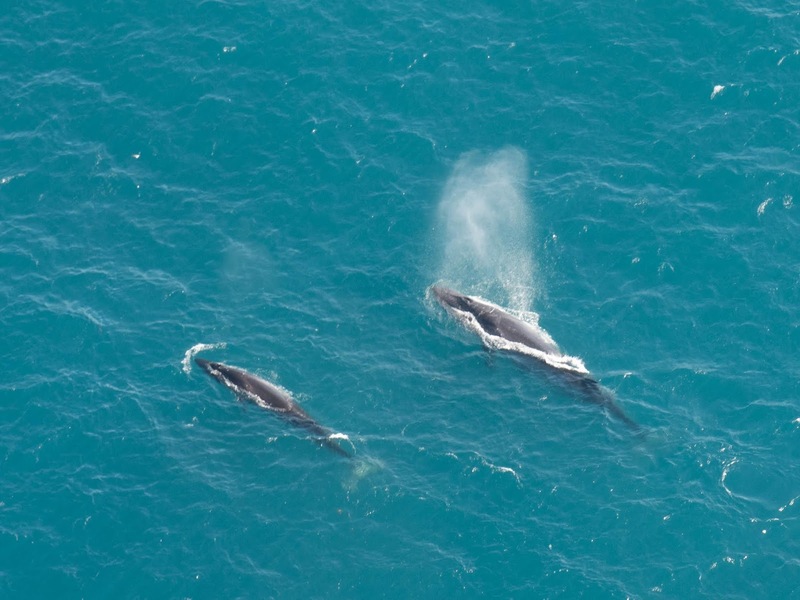 During our first visit to Kaikoura, on our way from Abel Tasman National Park to Lake Taupo, our planned Whale Watching trip was canceled due to heavy seas. Since we now had a couple of days to spare and it isn't too far from Christchurch we returned for another try. After this cool experience we decided on short notice to also go Dolphin watching the next day. Since this trip was extremely popular, there were only places for the 5:30am or the afternoon tour (by which time we wanted to be back in Christchurch). So after some deliberation we decided to brave the early morning and joined Kaikoura Dolphin Encounter. 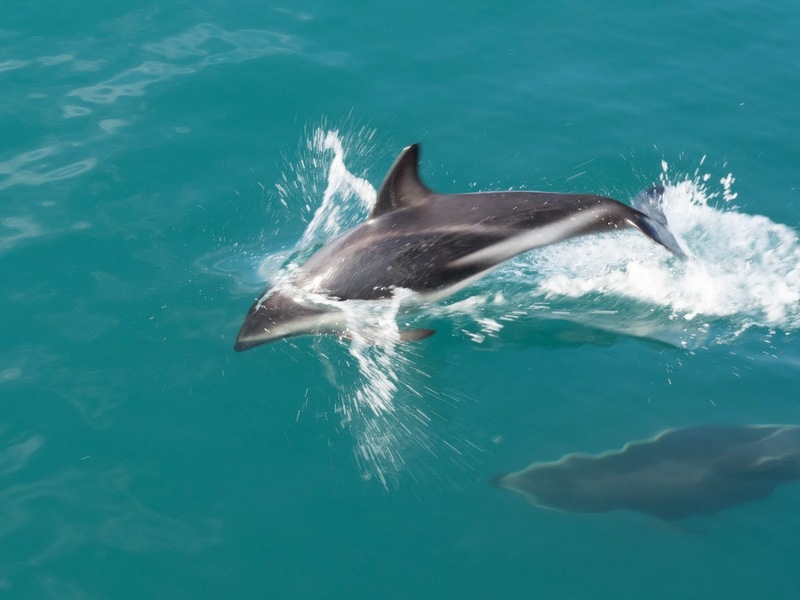 The main attraction of this trip was swimming with the Dolphins, but since this is extremely popular, it was sold out and we could only join as spectators. However, this wasn't too bad, since it gave us more opportunity to take pictures :). 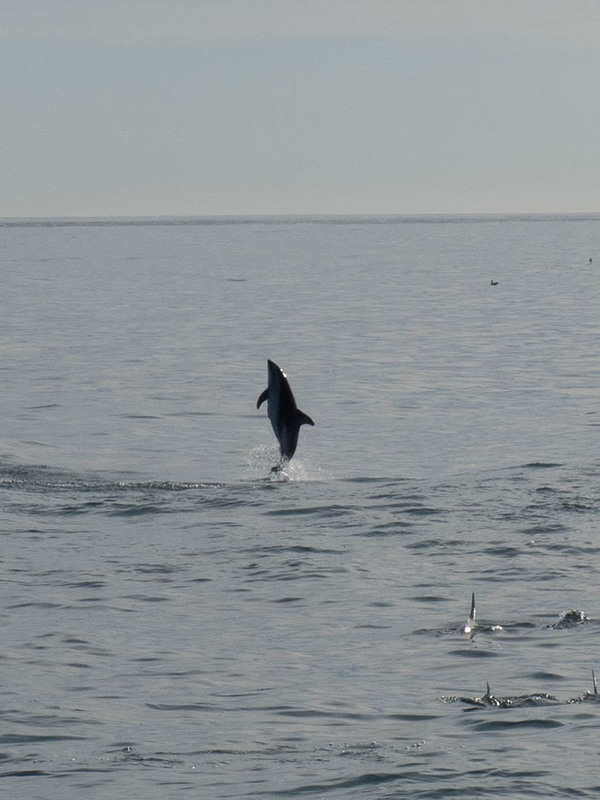 We saw mainly Dusky Dolphins, which are famous for their playfulness. So when the swimmers got into the water and made strange noises (as directed), the dolphins stayed around to take a closer look. 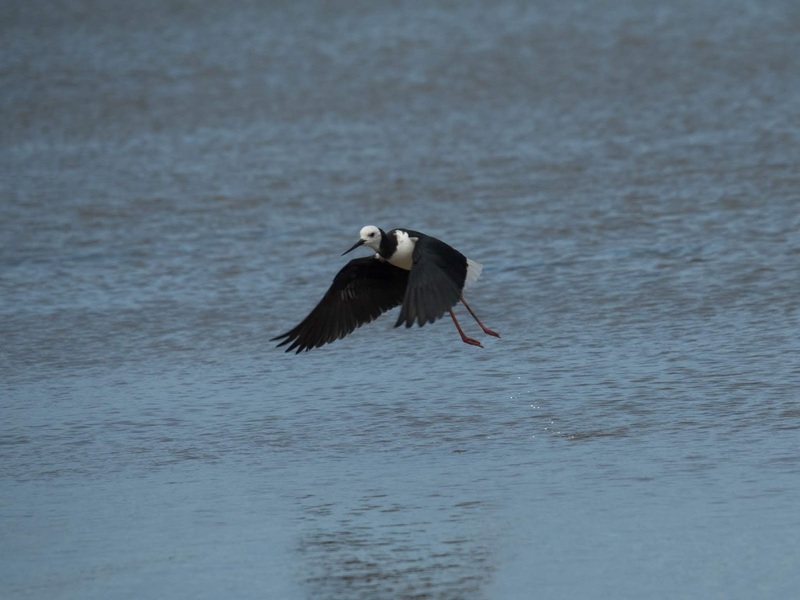 Another aspect of their playfulness is that they perform acrobatic backflips, which are extremely hard to capture on camera, or repeated jumping out of the water. All in all they are great to watch. 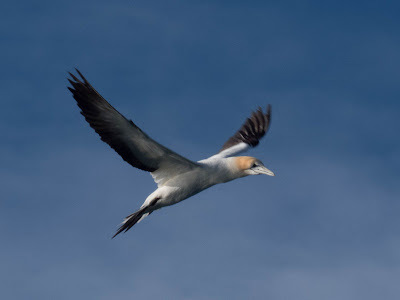 One of the highlights, which even the tour guides hadn't seen too often, was that the dolphins herded a school of fish into a baitball and continually ate them (normally they only feed during the night), this of course also attracted lots of birds and so we spotted Hutton's Shearwater, Albatross and Australasian Gannets. 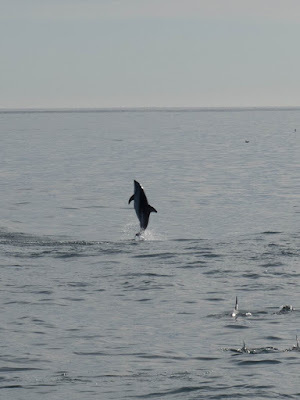 So it was a great decision to take the early morning tour, especially since the tour guides commented, that the dolphins are most active in the morning. Next time we might try to get a swimming spot though, that also looked awesome! 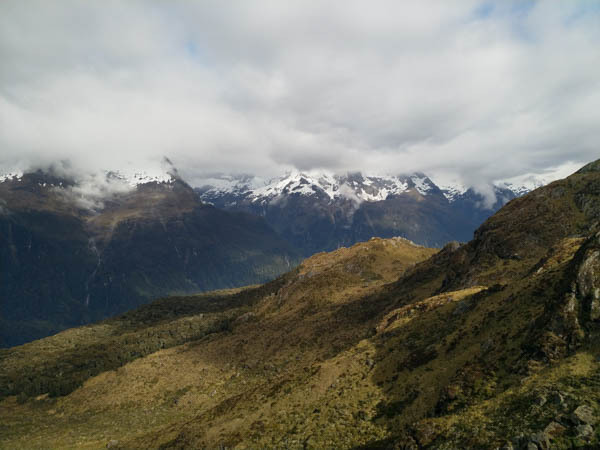 In addition to the Great Walks and many shorter walks we also undertook two day hikes to reach Mountain Tops. 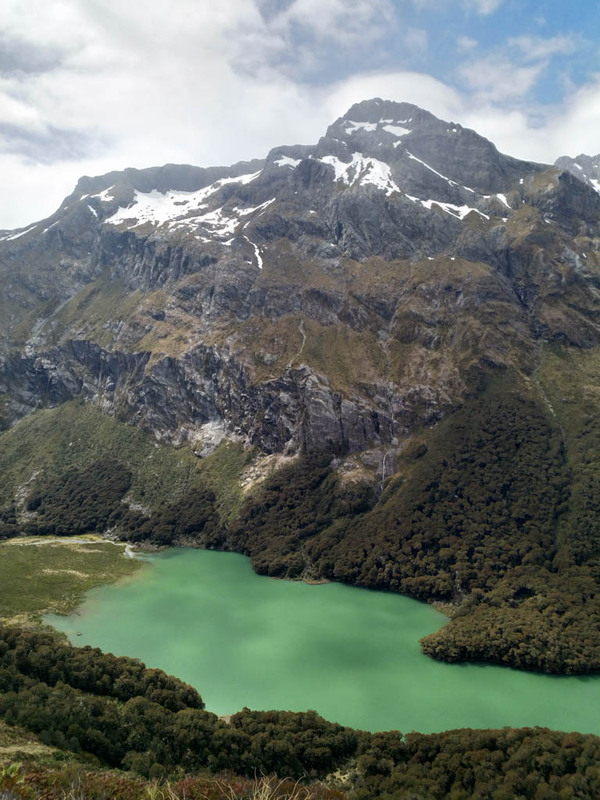 The first was from Te Anau on the South West coast of South Island. 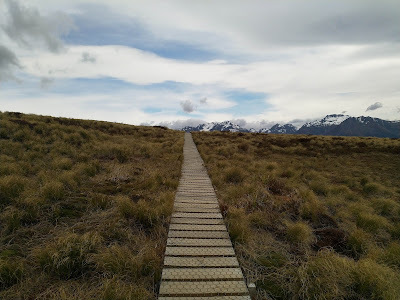 Originally, we kept the option open of also doing the Kepler Great Walk. 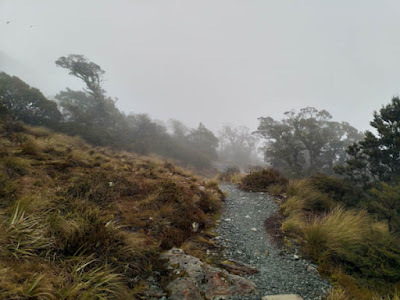 However, the weather forecast wasn't too good and we had a good tip from a DOC employee, that one of the most impressive parts can be done as a day walk, so we decided to do a one day hike. To get the most out of the day we took the Kepler Water Taxi to Brod Bay. From there we walked through a beautiful forest up to the tree line. In the forest it was quite warm, so we were surprised, when we saw that the hikers coming down were warmly dressed. Once out of the trees, we knew why, there was quite an intense wind blowing, which reduced the temperature drastically. 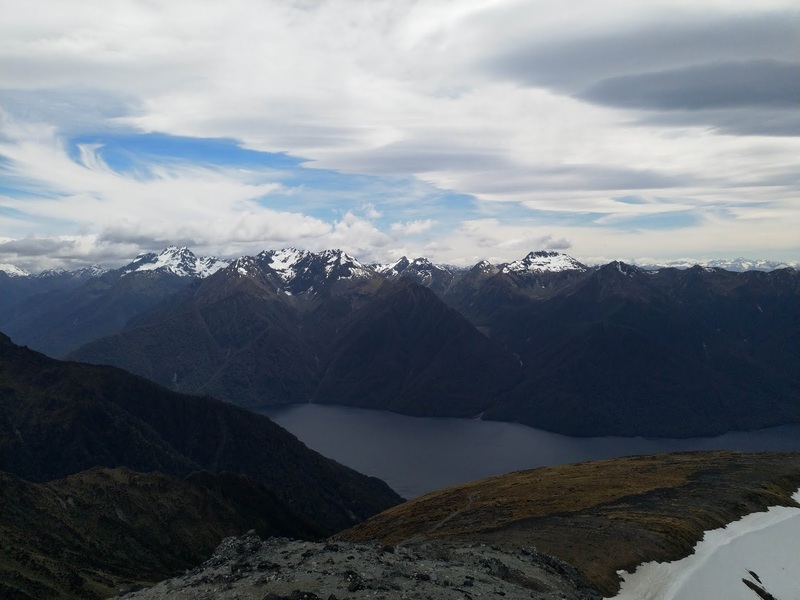 After lunch at Mount Luxmore Hut, we decided that we had enough time and energy to continue on to the summit of Mount Luxmore. 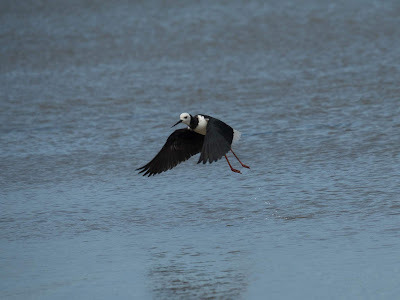 However, at times we weren't sure if we would make it, gusts of wind reached up to 60 kmh and we had to stop and wait for them to pass before continuing on. Fortunately, the way to the top wasn't too narrow and so we did make it all the way up. From there the views were breathtaking and worth the effort. On the way down we made good progress and so we were at the meeting point for the water taxi 30 minutes ahead of time. After 7 hours of hiking and 1'200 meters elevation change (first up and then down again), we were exhausted but very happy. 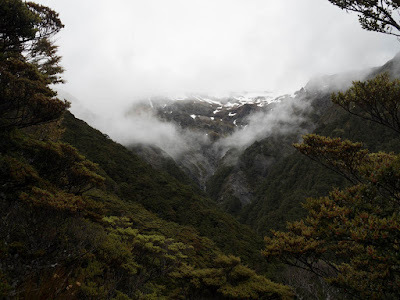 The second time we attempted to climb a mountain was at Arthur's Pass in the centre of South Island. Here the weather forecast wasn't too good either, so we opted for the easier route and took Scott's Track up to Avalanche Peak. 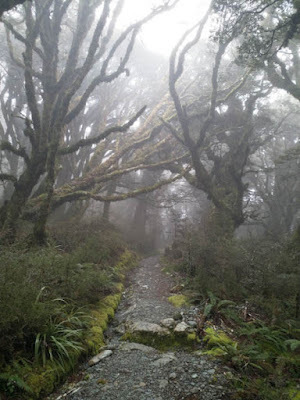 The track was very steep throughout and first passed through a dense but fascinating forest. 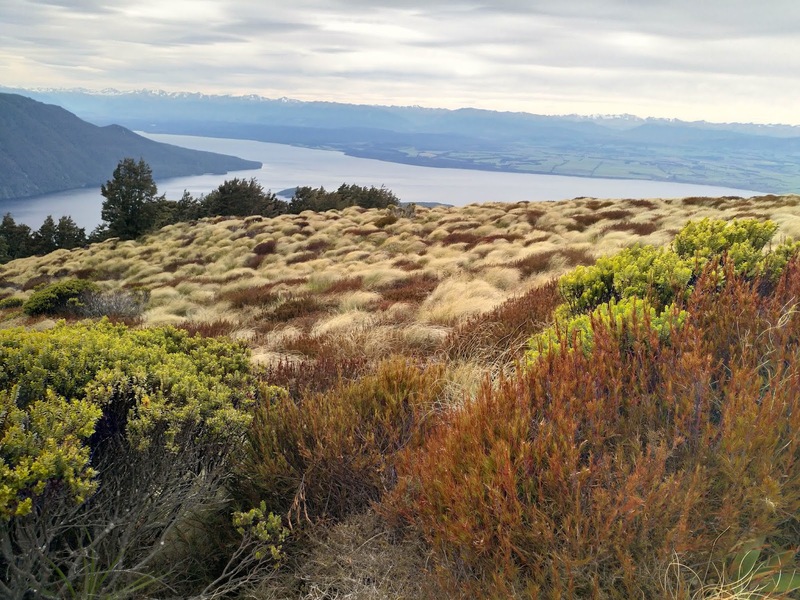 Once we had passed 1200 meters elevation, the forest gave way to large grassy stretches. 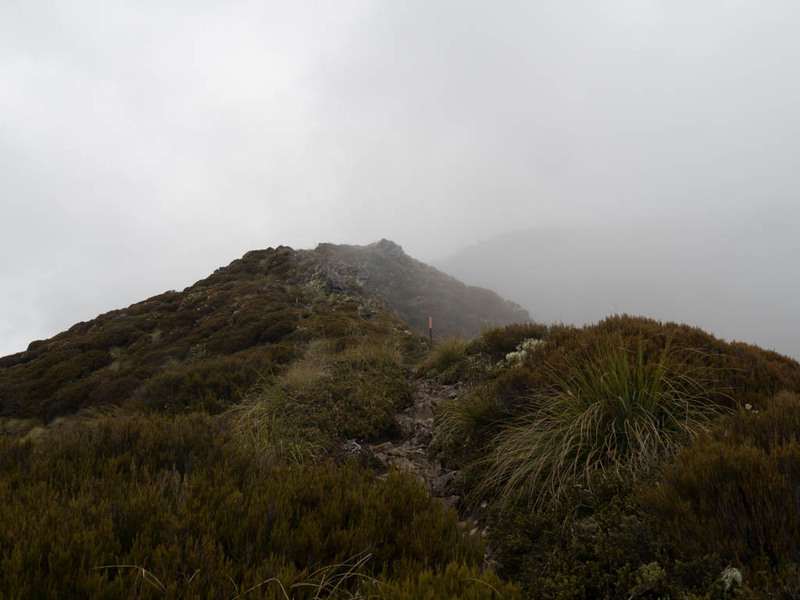 The views were fascinating throughout, especially because the cloud and fog cover continually changed, giving us different aspects of the same view. 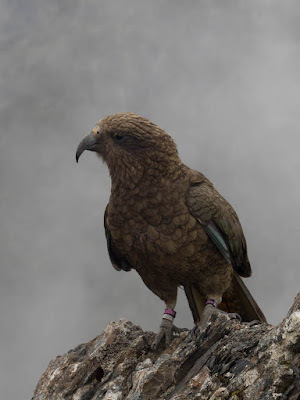 At one time we heard a Kea call out and fly overhead. We spotted it foraging for food on the slopes, throwing down rocks in the process. We climbed a bit higher until we were on the same level and waited what would happen. It decided to come and check us out allowing us to take great photos. Onwards we climbed, but close to the top the wind was picking up (it was getting cold) and the top was still covered in cloud. Additionally, the next part of the way looked even more difficult than what we had encountered before, so heavy hearted we decided to turn around. After a lunch break in a wind free place we had enough energy to tackle the way down and enjoy the views as well. 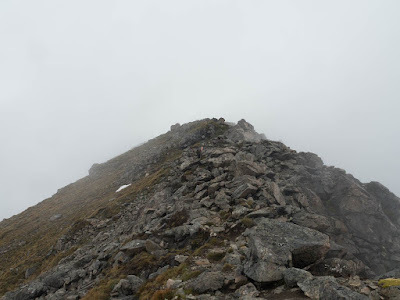 After 6 hours and 1000 meters elevation change (first up and then down again) we reached the car park, a bit sad that we didn't reach the top, but safe, healthy and happy with the experience. Returning from Stewart island we traveled along the South Coast (The Catlins) to the Otago Peninsula (Dunedin) and onwards to Oamaru. On the way we had many fantastic wildlife encounters. 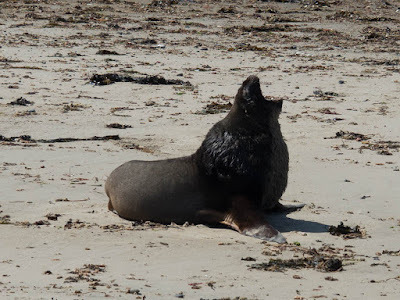 It started at Waipapa Point Lighthouse where we finally found the rarest sea lion in the world, the New Zealand Sea Lion. 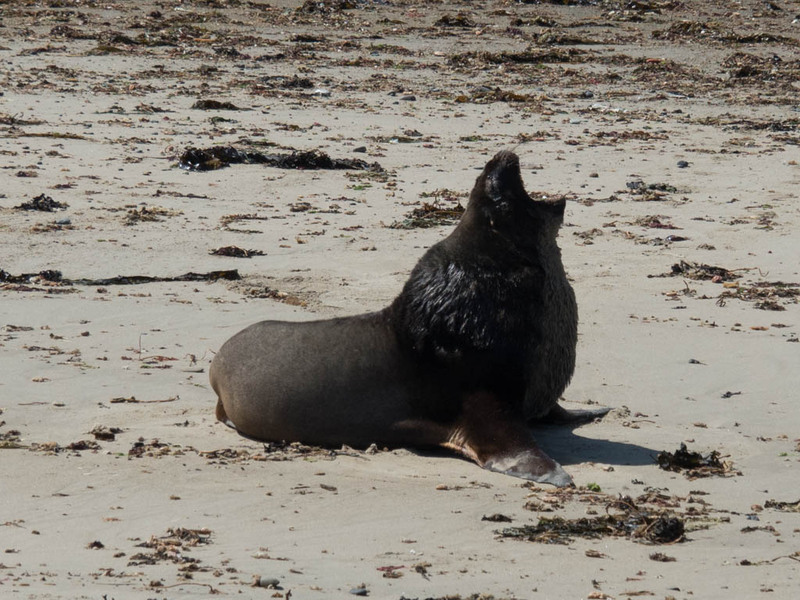 Two of them were lounging about on the beach not bothered by our presence at all. Nevertheless, we kept well away, so as not to provoke them. Next we did a short detour to Slope Point, the Southernmost Point on the South Island, and of course it featured the Southernmost Geocache as well :). 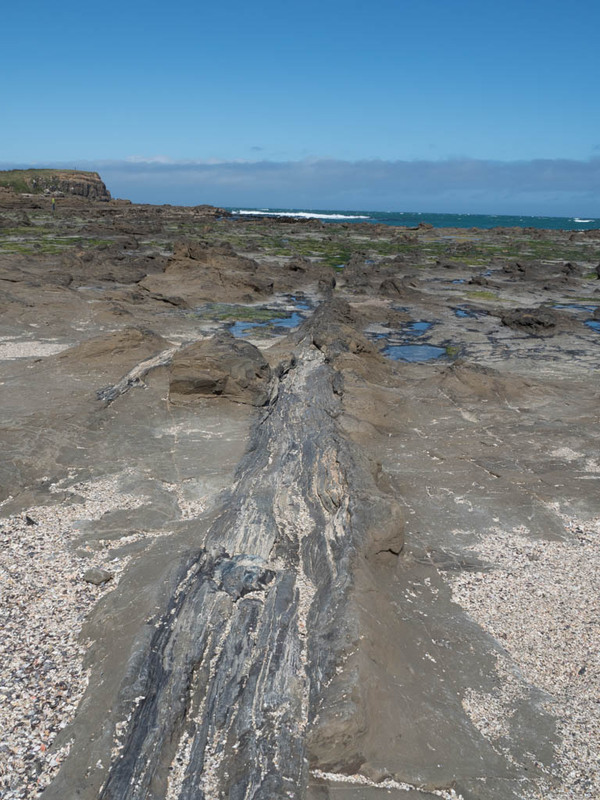 Our stop for the night was Curio Bay, which is famous for its Petrified Forest, resident Hector's Dolphins and Yellow-Eyed Penguins. The Petrified Forest was the easiest thing to visit, we were lucky that it was low tide, so we saw the full extent of it. 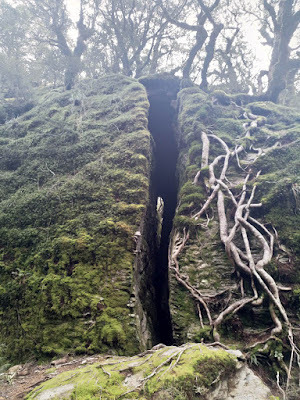 Most remarkable were the fallen tree trunks that were still visible within the rocks. The weather was quite windy and cold and this brought many waves to Porpoise Bay (just round the corner) and we couldn't spot any Dolphins. Neither did we see any Penguins even though we waited over an hour in the cold evening air. Knowing that they go to see at daybreak, I got up early for another shot. 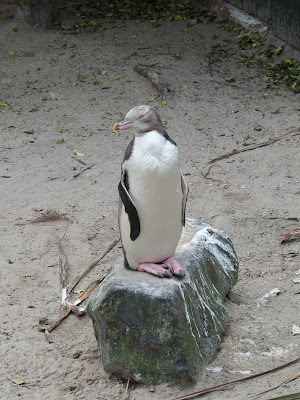 Once in place I already heard loud noises (the Maori Name for the penguin translates to Noisy Caller) and after a while I saw the first one appear. 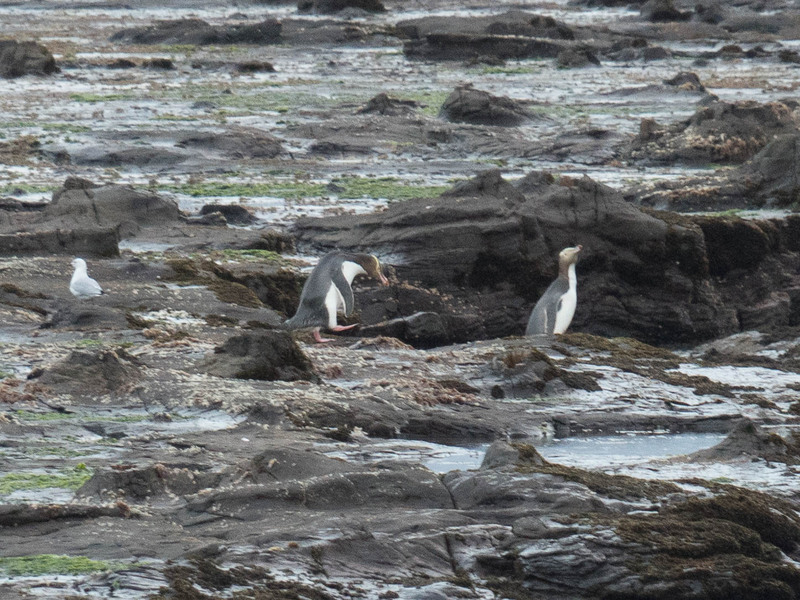 All in all I could observe two Yellow-Eyed Penguins for about fifteen minutes while they got ready to go out to Sea. On our way further East we stopped at a number of Waterfalls (one of which, Niagara Falls is the smallest waterfall in New Zealand) and at the very scenic Cathedral Caves. Huge Caves which have been eroded into the cliffs near the beach (thus only accessible at low tide). Our last stop before heading back North was Nugget Point, another very scenic lighthouse. However, here the wind hit us with its full force and we didn't stay too long. 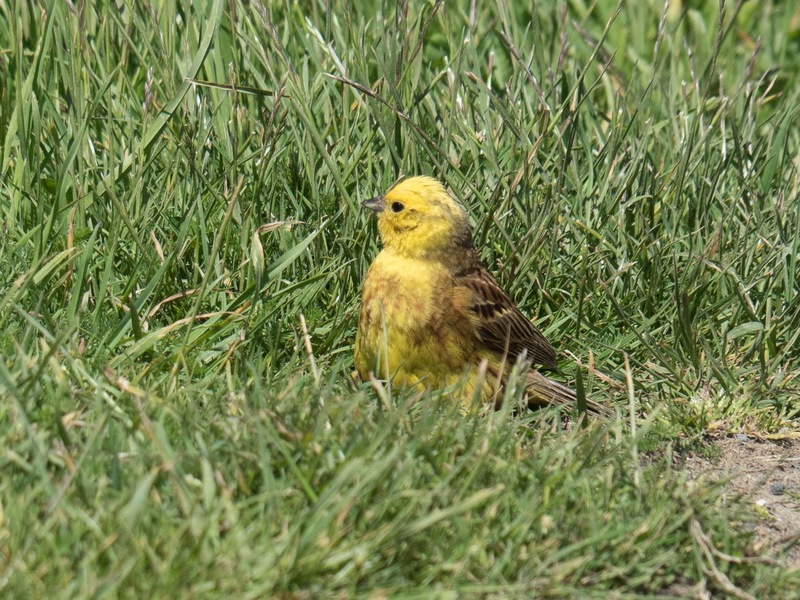 In the grass we observed a Yellowhammer, which couldn't fight the wind and was always blown down onto the ground again, we managed to snap a quick picture and then left him in peace. In the late afternoon we visited the Royal Albatross Centre, where we joined a tour to visit the only Albatross breeding colony on the mainland. We were lucky enough, that a group of teenage Albatross were around; they weren't busy with breeding or feeding, so they used the strong winds to fly circles around us. A really fantastic experience! 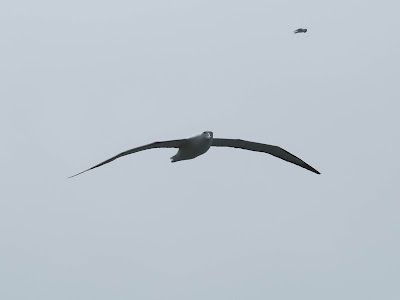 The Albatross weren't the only highlight at the Albatross Center, there were also lots of Black-Winged Seagulls and Red-Billed Seagulls around. 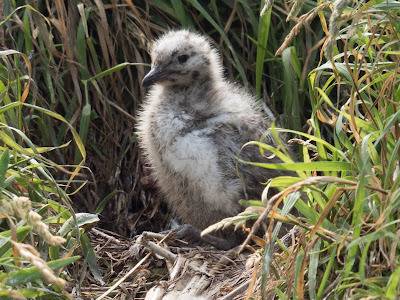 The latter were also breeding just next to the path and we could see some of their chicks up close. On the way back to our hotel we spotted a Royal Spoonbill searching for food on the beach. 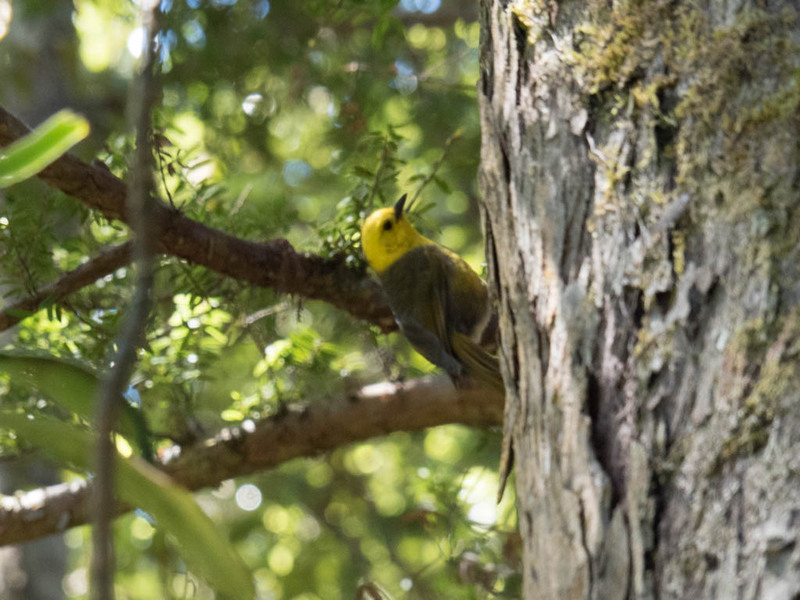 A very curious bird indeed! 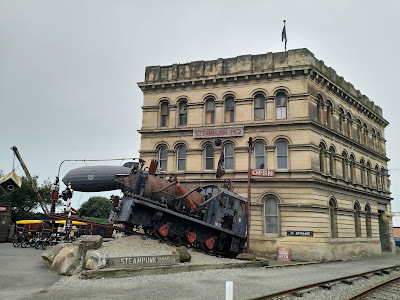 The next day we headed North to Oamaru, which has an old Victorian center with many small shops and interesting museums (Steampunk HQ and Whitestone City are worth a visit). But what drew us to Oamaru in the first place was the Oamaru Blue Penguin Colony. 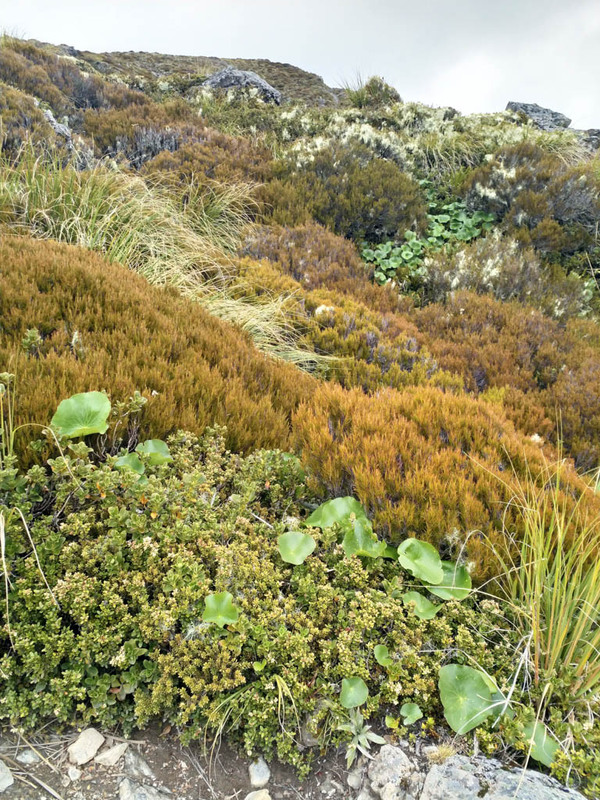 A conservation area where hundreds of Little Blue Penguins are nesting. 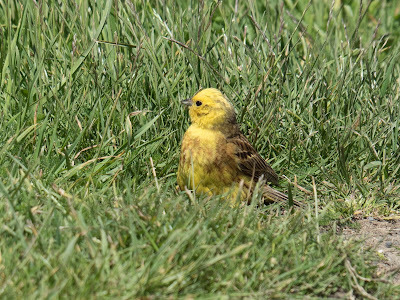 We visited during the day, where we could see one adult with two chicks in one nesting box and a juvenile in another. The interesting part was the evening viewing, where they came on shore in big groups (called rafts). 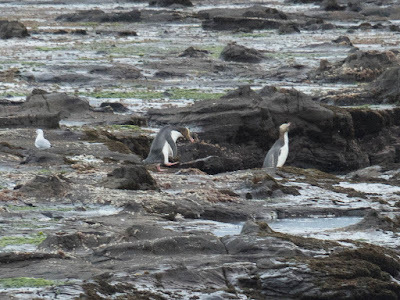 During our 1.5 hours there we saw over 100 penguins come ashore. After four rainy days in Invercargill we headed further South to Stewart Island for our next Great Walk. As soon as we got off the ferry the weather improved and during a short exploratory walk to Archers Point even the sun made an appearance. 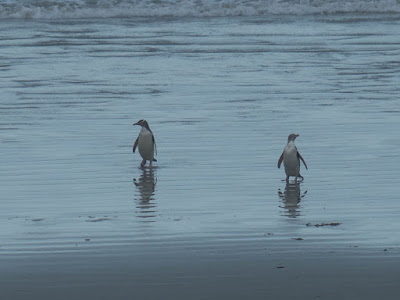 Just before sunset we headed to the wharf, where the Little Blue Penguins normally come ashore. 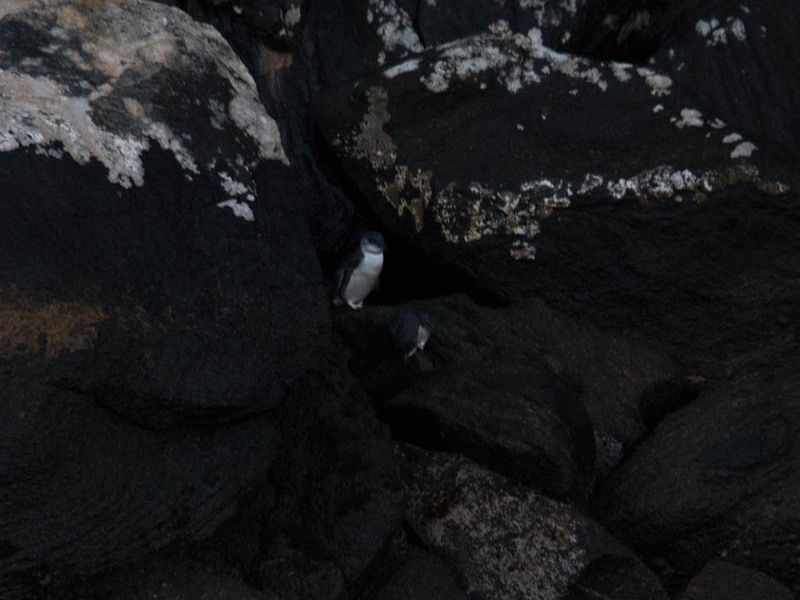 We were there 45 minutes before sunset and the first penguin showed up ten minutes later, which was great, because it was still light enough to get a good view. Over an hour we saw three penguins coming to shore. The next morning we started with the Rakiura Great Walk. To get to the start we had to walk 1.5 hours along back country roads, but fortunately, there was almost no traffic (after all, there aren't that many cars on the island). 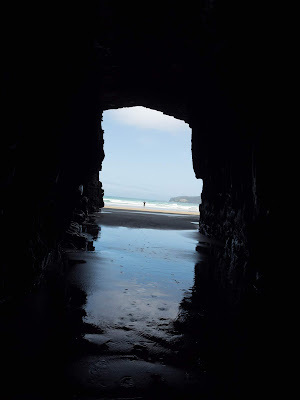 At Lee Bay we looked out for the rare New Zealand Sea Lions, but none were present. From there the track was a very pleasant meandering walk along the coastline with some beaches and some hills. 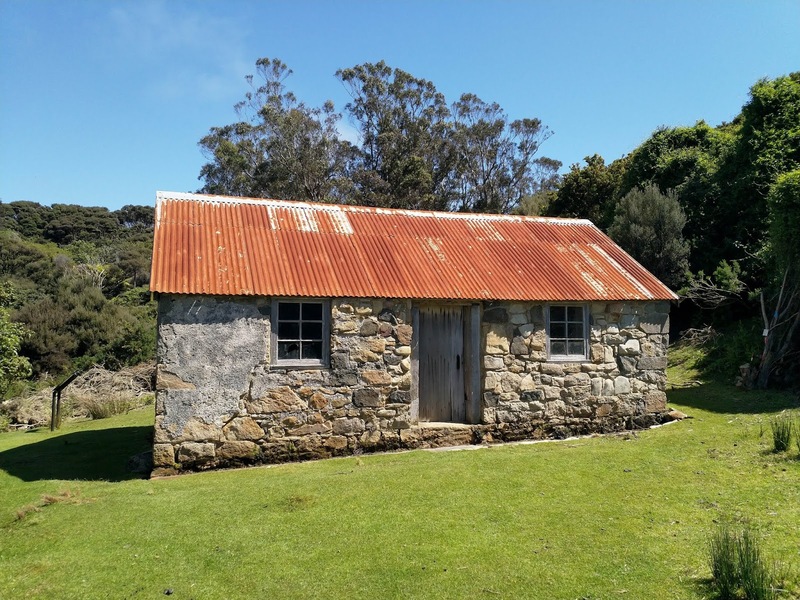 We arrived at Port William Hut in the early afternoon and could secure a nice sleeping spot. The afternoon was spent reading, chilling and looking for the Geocache close-by. What we didn't have on the agenda, were the sandflies. They were numerous and by the time we got the mosquito spray out, we had been thoroughly bitten :(. Stewart Island is famous for its diurnal Brown Kiwis. Normally, Kiwis only come out at night, but on Stewart Island they are regularly spotted during the daytime. Since we were not lucky the first day, we headed out after sunset for another look. 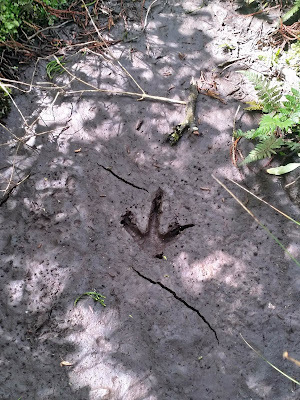 And indeed, Fe spotted a Kiwi in the underbrush. I only saw it's rear before it silently crept away into the bush. 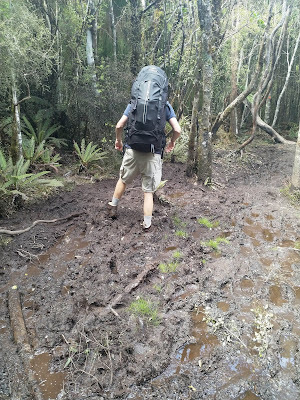 The second day was a long inland track crossing over to the other side of the peninsula, and we were warned, that this would be the muddiest track we had ever encountered. And so it was! 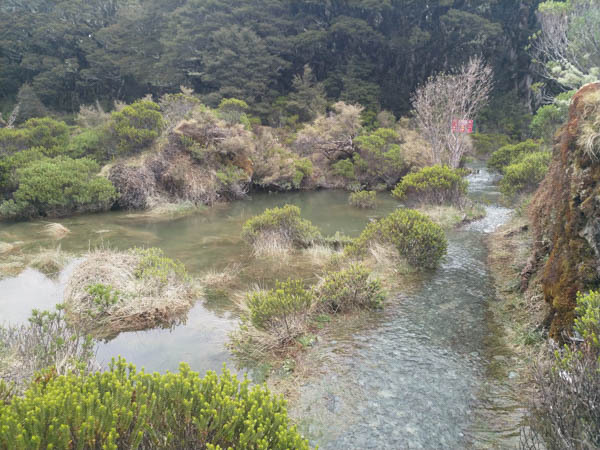 Even though the rangers tried to make it easier by placing logs and stones in the deepest puddles, we sank into the morast several times. Fortunately, it was never deeper than our shoes. However, it wasn't all that bad, and the track led through a beautiful forest, which we enjoyed a lot. We even spotted a Kiwi print in the mud next to the track. 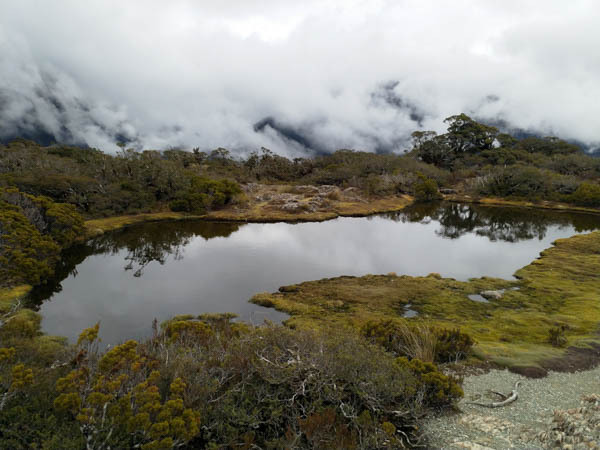 We were the first to arrive at the next Hut (North Arm Hut) in the early afternoon and could quietly settle in. 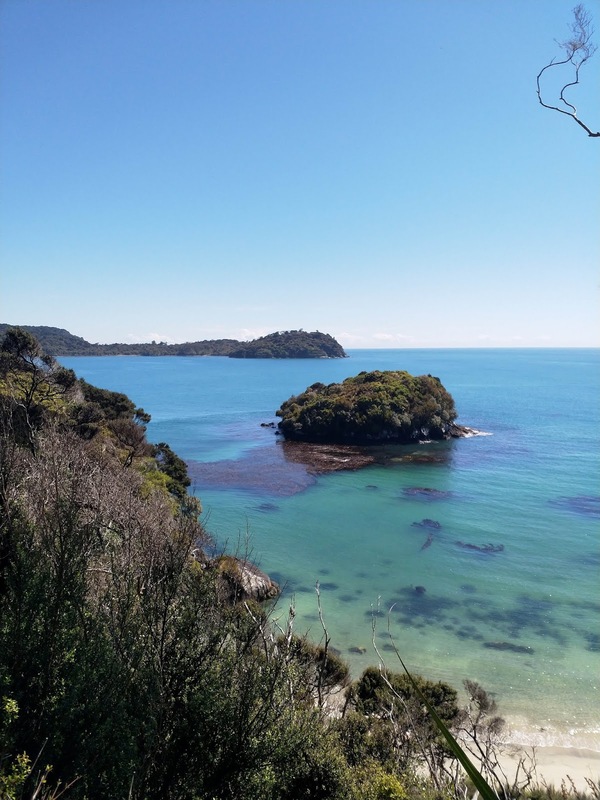 After a while we even went for a short swim and suprisingly, the water was warmer than when we were in the Abel Tasman National Park! After sunset we went to a spot where Kiwi were spotted recently and even though we waited patiently for one hour, none turned up. On the way back we made a detour, where we spotted a Morepork! That is a small brown owl which is only active at night and thus very hard to spot. So that was a real highlight for us! The last day the weather turned a bit worse, while it was still dry, a strong and cool wind came up, encouraging us to walk quickly to get back into the warm. The track was in much better condidtion than the day before and there were only a few mud puddles to navigate. We came across several beaches again, but due to the lack of sunshine they were not as brilliant as on the first day. Even though we were glad to arrive at our destination we had really enjoyed this Great Walk and can recommend it to avid hikers. 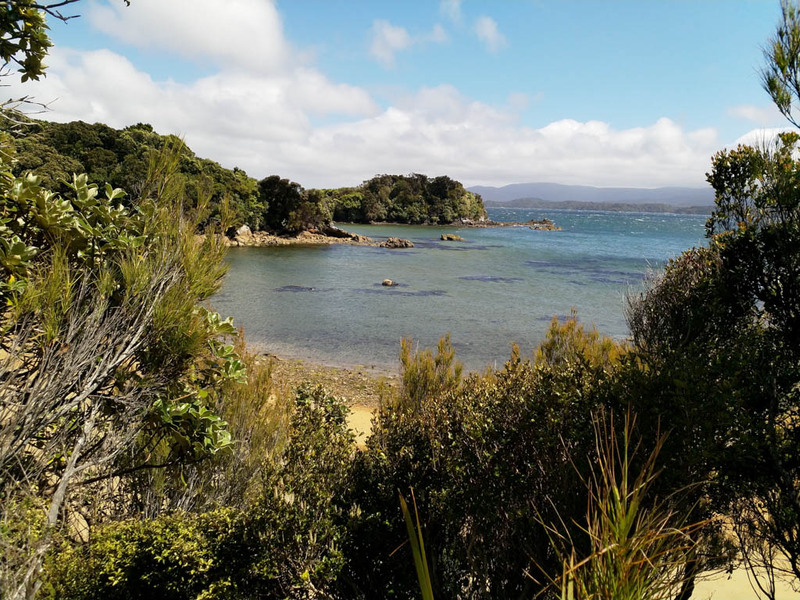 We knew that Stewart Island was special, when we planned our trip, so we had two extra nights on the island after our walk finished. On the first day we headed to Ulva Island, which is an island sanctuary that has been predator free for almost twenty years and thus is a haven for birds. 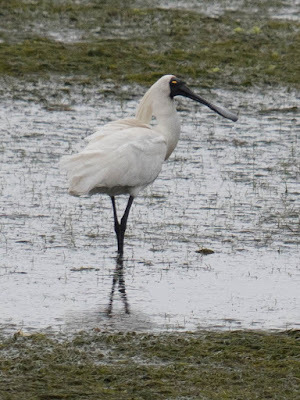 We saw Tui, Yellowhead, Saddleback, Fantail, Kaka, Kakariki, Wood Pidgeon, Tomtit, South Island Robin, Weka, Oystercatcher, Red-Billed Gull, Stewart Island Shag, and more that we couldn't clearly identify. Since Ulva Island was South of that part of Stewart Island which we could easily access, it also meant that finding a Cache there, was to be our Southernmost Cache. 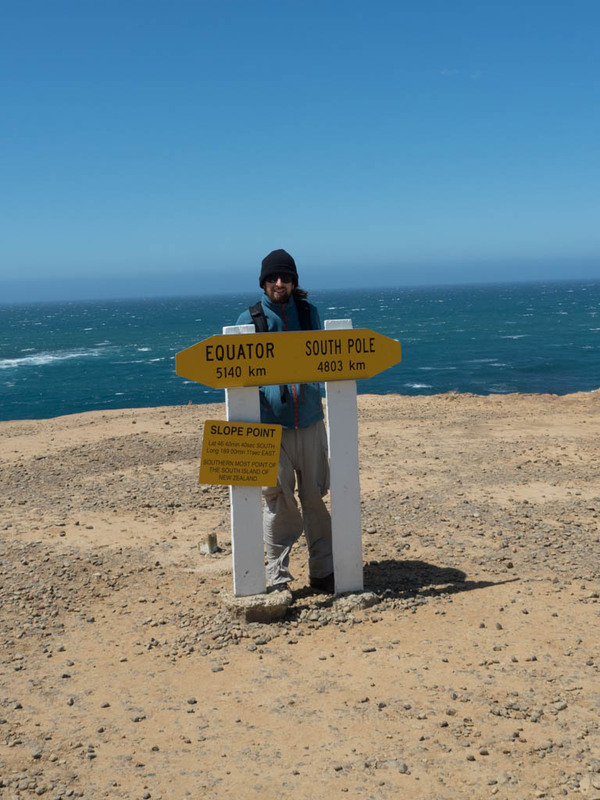 And it will remain so for a while, because only Antarctica and the Southern tip of South America is further South than here. 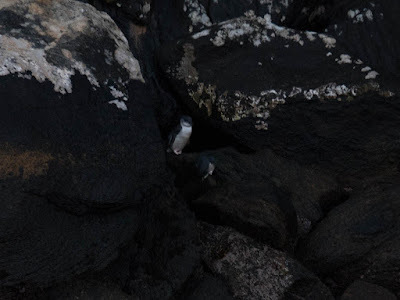 After dinner we headed to the wharf again to see more Little Blue Penguins. 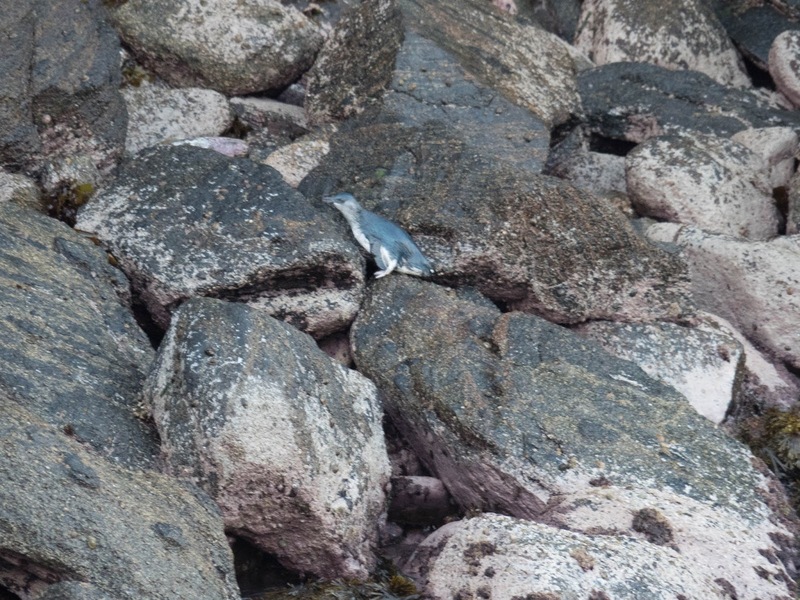 This time we only saw one Penguin coming in, however, after a while I spotted movement in a cave and soon after two penguins came out to walk and play around for a bit. For about twenty minutes we could observe them which was a great experience! But our evening wasn't over yet! 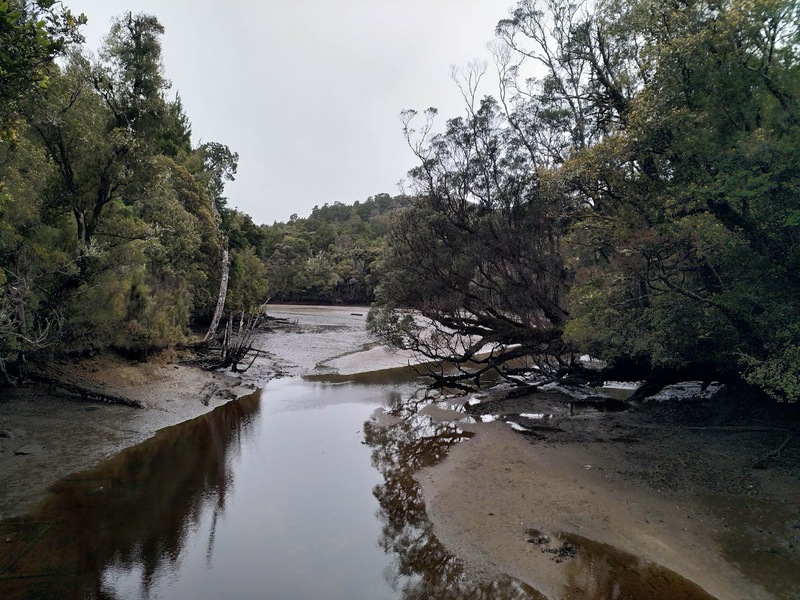 So far we didn't have much luck with Kiwi spotting (except the half Kiwi on our first walking day), so we joined a Kiwi spotting expedition by Ulva's Guided Walks. 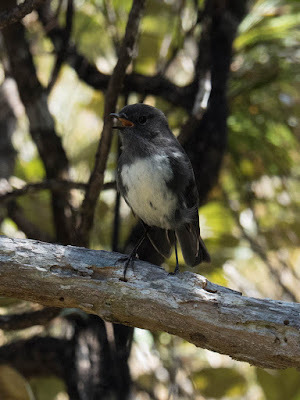 The special bit about this tour was that it went to Mamaku Point, a special private conservation area which is guarded by a biosecurity fence ensuring that no predators can get access. 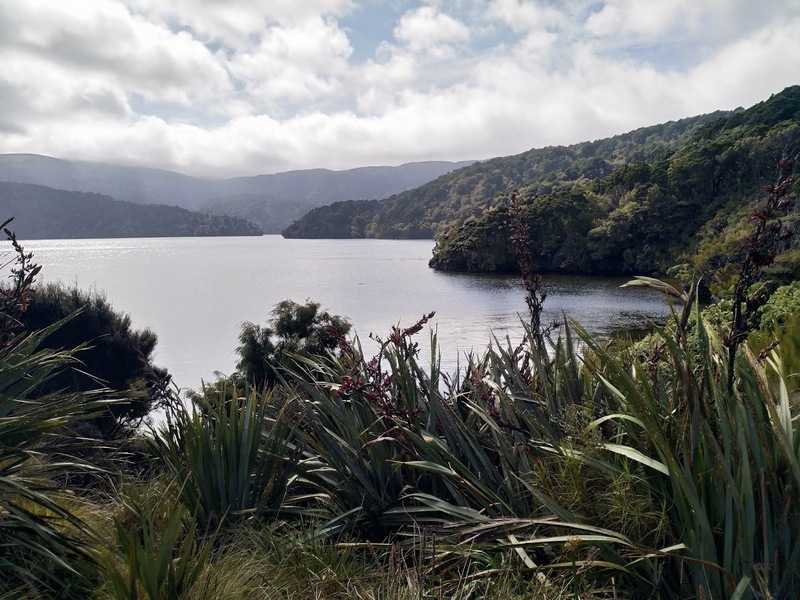 In addition it has the highest Kiwi density on Stewart Island. Unfortunately, the Kiwis were again extremely shy, and besides a far away call we spotted nothing. We still enjoyed the outing because it turned out to be a clear night and we had a perfect view of the night sky and the Milky Way. 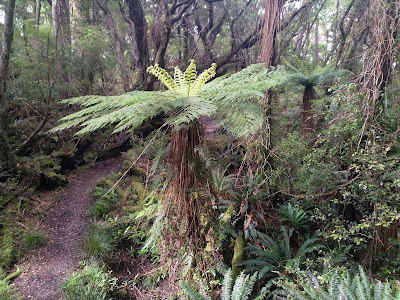 Ulva was heartbroken, that she couldn't show us a Kiwi (a first for her) and so we took a small detour on our way back and there we spotted two Kiwis in quick succession. So we finally did see our Kiwis :). We wanted to do a multi-day hike in the Fjordland. 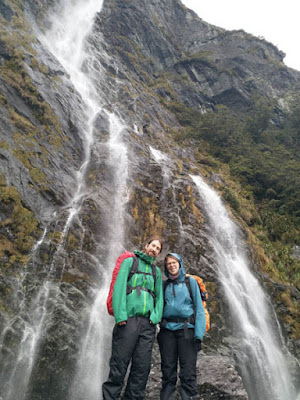 Unfortunately, Milford Track was fully booked within two days and we were too late. 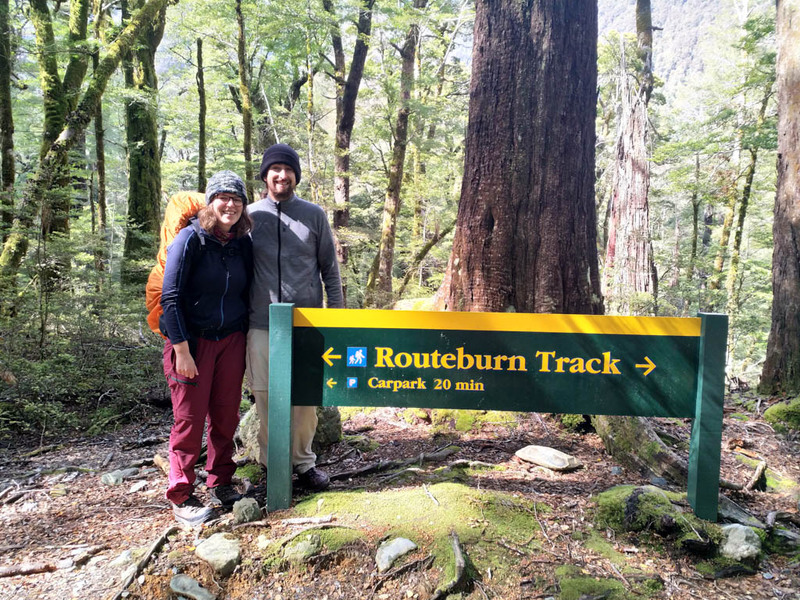 Some research pointed us to the Routeburn Track which is a bit shorter but just as beautiful. From Queenstown we drove to the Northern end of the track at the Routeburn Shelter. Since this track ends in a different place, we hired Trackhopper to take our car to the finishing point while we were walking. 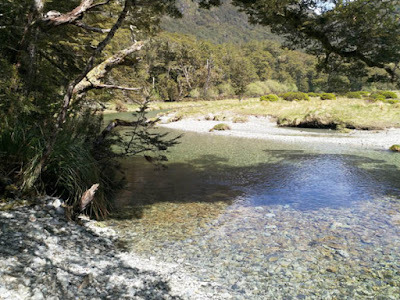 This was a great decision, it saved us a lot of time as we had plans to visit Milford Sound which was very close to the end of the track, but about 4.5 hours from Queenstown. We started off with beautiful weather and the path led through a dense forest.hill. 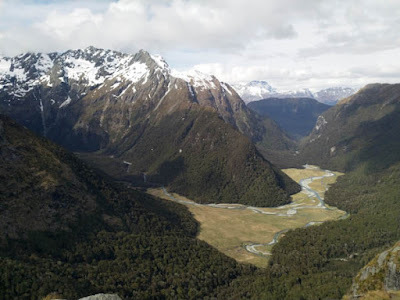 After a while, we reached the Routeburn Flats, which is a long flat valley which looks like they had filmed part of Lord of the Rings here. Then came the most strenuous part of the day, one-hour steep uphill brought us to the Routeburn Falls, where our first hut was located. Since we arrived quite early, we had time to get settled, relax for a bit and then take another walk to a lookout. 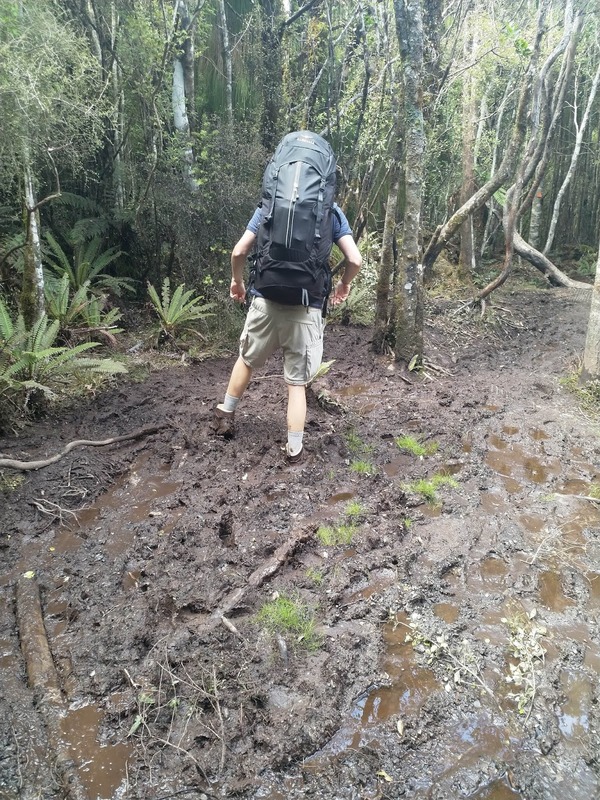 The climb was way steeper than imagined, but without the heavy backpacks it was manageable and at the top we had a beautiful moor landscape and terrific views of the Routeburn Flats. The weather forecast for the next day wasn’t too good. Showers in the morning turning to rain in the afternoon, so we decided to get an early start. After a steep climb we reached Harris Saddle, the highest point of the walk. From there it was a long and easy walk along the side of the mountains with beautiful views into Hollyford Valley and all the way to the ocean at Martins Bay. So far the weather was very kind with us, cloudy but dry. After getting a first glimpse of Lake Mackenzie and our destination for the day, we considered a lunch break, but since it started to drizzle, we continued for the last hour of steep descent. Close to the hut we had to add a detour as Lake Mackanzie was so full, that it had flooded the path we wanted to take! After a long lunch break and a nap, the weather was still dry and so we added another short walk to the impressive Split Rock. The weather forecast for the last day was simple: rain. However, after the good luck on the day before we were optimistic until we got up in the morning and saw the rain. No worries, we were prepared for this and got all our rain gear out. And again, the weather was much better than the forecast, because the rain stopped after half an hour and apart from some very fine drizzle didn’t start again for the rest of the day. 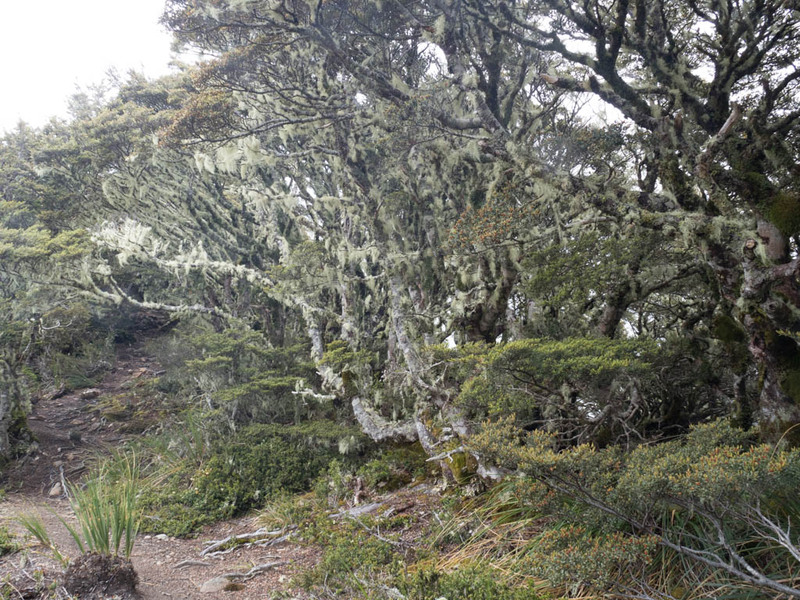 Our walk led us through a beautiful forest full of moss-overgrown trees. With the rain and fog it was even more impressive. At one point we saw a Kea, the only mountain parrot in the world, flying over us and stopping for a rest in a tree above the path (too far away for pictures). Around lunchtime we reached Lake Howden and since the sun started shining, we stopped for lunch. 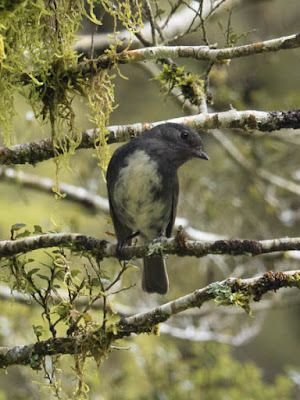 We had great fun with a South Island Robin and a female Chaffinch. Which were staying very close to us, probably hoping for crumbs. 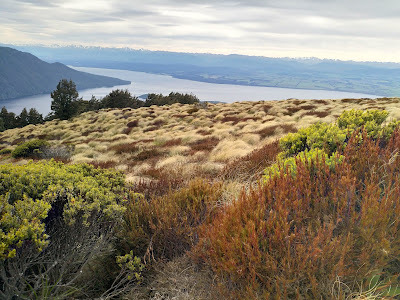 Since the weather had further improved, we added a detour to Key Summit, a hill with stunning views and beautiful moorland. 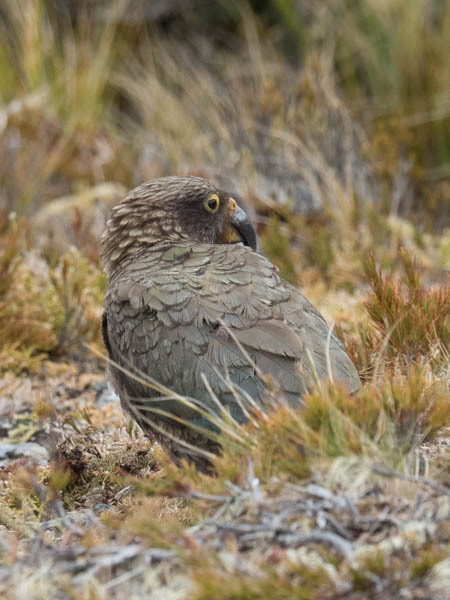 The highlight, however, was the Kea that was digging up roots and wasn’t bothered by our presence at all. One and a half hours later we were at The Divide, the end of the track where our car waited for us. We had a great time on the Routburn Track and can highly recommend doing it. P.S. 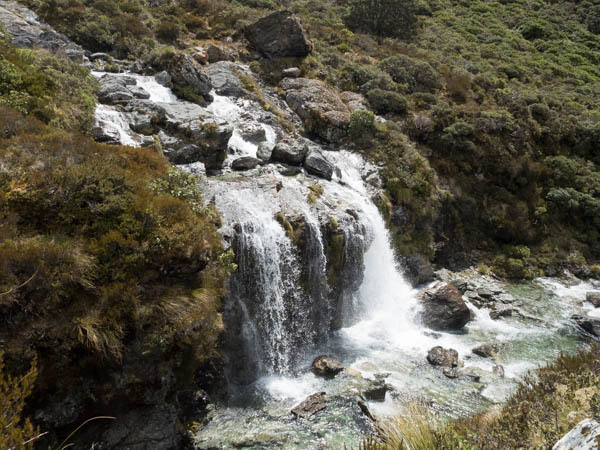 As Fe protested, that there are no Waterfalls featured in the text (and we encountered quite a lot due to the rain), here a picture of her most favorite one: Earland Falls with 174m height.